I went to a school that was arts-focused, but I don't really have any artistic talent so I always chose drama over fine arts or musical theatre. Most of my fellow students took it very seriously, wanting desperately to become the next big actor, and a couple of them have had some stage success and one of my tenth grade classmates had a stint on a US comedy show. But I was kind of a pretentious git and preferred Greek soliloquies to anything from the 20th century. I knew I wasn't going to be an actor, but I really wanted to work on my speech and breath control for when I became a politician. Thank goodness I gave up on that dream! One of my teachers was a very well-respected stage actor who came from the same city as the author of this book, in Ontario. He often made us do Q&A sessions in character. Sometimes it was a character from a play but most often he made us make characters up. I had a hard time doing this, so his advice to me was to watch the weirdos. Just people watch and look for the mannerisms and stories of the oddballs I encountered, because they are the most interesting. He was right, they are. Perfect people aren't as intriguing. 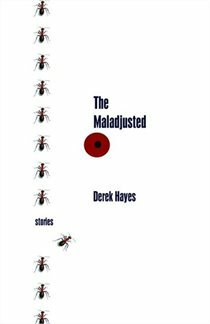 It's intriguing then to read Derek Hayes' short story collection, The Maladjusted, which features 16 short stories about the oddballs we encounter in life. Each story is told through a different character's voice, and I am impressed that he can keep them all separate and so very unique. The fascinating thing is that you are not sure in each story who is the maladjusted one, the narrator or someone he encounters. In Inertia I am now fairly certain it is the roommate, but in the next one, My Horoscope, the roommate who was the oddball turns out to be the normal one in the room. Not all of these characters are sympathetic, but some are, like Marla from A Good Decision, who is sorting through the relationships in the staff room as well as in her personal life. Others are unsympathetic but you are happy they get what's coming to them, like Brian in An Empty Tank of Gas. Brian is an English teacher in Turkey, and he reminds me of so many specimens I have run across in Japan. He fancies himself a lothario, and decided to relocate to a country whose women he believes are "sultry, nicely tarted up, not cynical or suspicious, but sweet." He is a man whose previous relationship consisted of a single woman who didn't finish junior high, and therefore he decided to write off an entire continent of women. It's satisfying when his two-timing is exposed in the middle of class and his roomie's girlfriend starts ordering him around. Women of the World: 2, Charisma Man: 0. Hayes has an eye for character, and manages to convincingly draw completely different personalities for every single one of his players. I hope that this debut book is just a small sample of what's to come. This is the 39th book I have read for the 5th Canadian Book Challenge.